The department of Rivera was named after one of Uruguay’s national heroes, General Fructuoso Rivera. It was originally a region of merchants originating from Spain, Italy and Portugal. It became an important trading post, where wagons loaded with various merchandise stopped over before embarking to other parts of the country. At present, the department’s economy is centred on farming, meat and dairy products, soybeans, grapes, and wineries. Rivera City is in the department of Rivera. It was built on the summits of two basalt hills in the Santa Ana Hills. 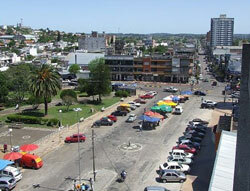 Because of its central location within the department and an extensive railway network that connects it with other regions within Uruguay and neighboring Brazil, Rivera City serves as a trading centre for agro-industrial products, such as sheep and cattle, grains, sweet potatoes, peanuts, vegetables and fruits coming from the surrounding pastoral areas. It is also a manufacturing centre for textiles, mosaics, brooms, cigars and cigarettes.